wow! 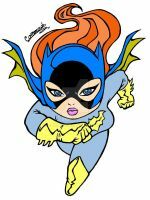 thats a great Batgirl! the only problem I have with this is it's not on it's way to Portland . Love it! Bit of "The Batman" influence in there with the skirt, yes?